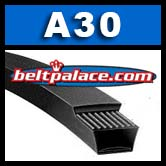 A30 Power King V Belt | Classical A30 Industrial V-Belt | A30 Belt Replaces Standard Raw edge A30, 4L320 FHP V-Belts. Home > Light Duty V Belts > FHP V Belts. 2L through 5L Sections... > 4L Light Duty V-Belts (FHP) 4L Sections - CLICK HERE! > 4L320 FHP V-Belt. Consumer Brand. > A30 Power King V Belt. Classical A30 Industrial V-Belt. A30 BANDO Power King Belt. Classical A30 Industrial V-Belt. 1/2” Wide x 32” Length OC (13mm W x 813mm L OC). Features bias cut, insulated ultra-high strength polyester cords, superior compression section for high temperature and load carrying performance. Heat and oil resistant. High quality for low cost! NAPA, Grainger, PIX (low grade) A30. Replaces appliance belts for Frigidaire, Tappan, Westinghouse Electrolux: 134511600, AP3867042, 134161100, 1156860, 131234000, 131686100, 3204418, AH1146950, EA1146950, F145371, F145371-000, PS1146950. 4L320 FHP V-Belt. 1/2” W x 32" Length. Replaces Classical A30 V Belt on light duty applications.